100% easy care king size patchwork cotton quilt set is a charming addition to any bedroom theme besides giving it a luxurious feel. It would certainly make a most charming housewarming gift. There are super king size quilts to cater to those with extra large beds. Comfort is key, hypoallergenic, cool and breathable are also important features to check out before buying your king size patchwork cotton quilt set. The quilt set comes with 2 pillow shams. 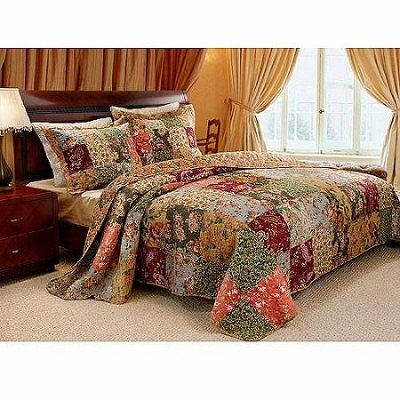 This oversized king quilt set has a complicated, detailed paisleys and beautiful floral prints design and has a vintage rose fabric bound edge and back. A gorgeous patchwork cotton quilt with bright and cheerful colors, it can also be used on its reversed side with yellow floral prints. Prewashed and preshrunk, the king quilt set also includes two matching king-sized pillow shams measuring 20″ x 36”. The quilt itself measures 105″ x 95”. Using this king size patchwork quilt on a queen size bed is a good idea as it will result in the quilt hanging elegantly down almost to the floor and covering the whole thickness of the mattress. However, if you prefer your oversized king patchwork quilt to be more like a patchwork quilted bedspread set whereby the quilt drapes beautifully right down to the floor, then you might like the bigger size 120″ x 118″ quilt instead. 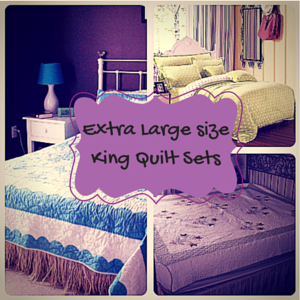 This set is just perfect as a king size summer quilt but will need an extra blanket for winter. This beautiful 100% cotton antique floral quilt set adds a nice refreshing spring and summer touch to your bedroom decor. If you wish to give a king size patchwork cotton quilt set as a housewarming gift, then this would be just perfect.